Novel Matters: Today and Friday! 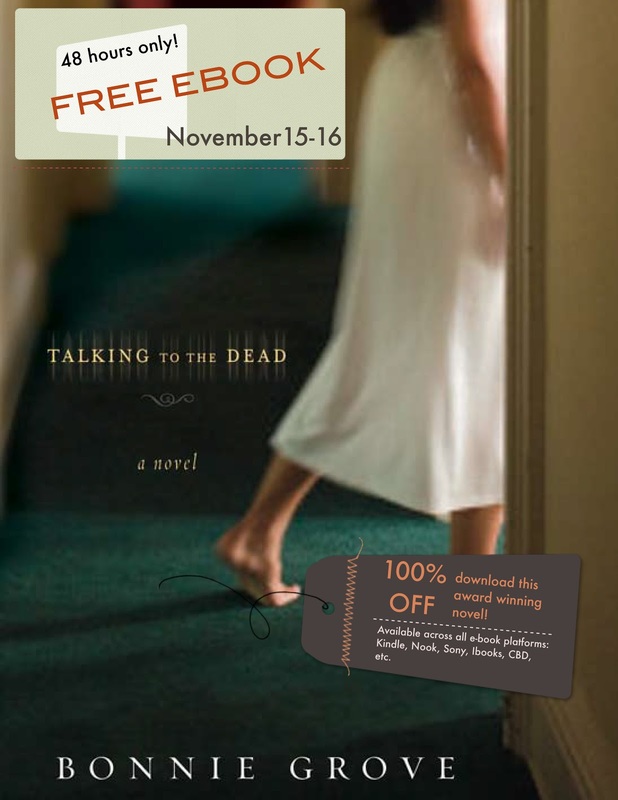 Download Talking to the Dead for FREE! Today and Friday! Download Talking to the Dead for FREE! Today and Friday Talking to the Dead by Bonnie Grove, is a FREE e-book! Download this award winning novel for FREE! And, of course, it would be lovely if you could spread the word to friends, family, pets, random strangers, cute guys you pass on the street--anyone at all! If you'd like to help spread the word on Facebook and other social media, let me know, and I will email you a file (jpg) you can upload for easy peasy love fest fun. We had a brilliant conversation this week (and it's only Wednesday) about success, what it is and what it means to us. Katy said she was happy with obscurity and I agree with her. While I've never known the pressures of world-wide fame, I'm pretty certain I don't want to deal with the invasion of privacy that J.K. Rowling has dealt with. I'm a nice person--hey, I'm Canadian, we're all nice--but bushes of journalists growing outside my front door would turn me cranky pretty quick. I'd totally go ZsaZsa Gabor on them. Which is ironic because of what I'm going to say next. So let me keep my obscurity, while at the same time doing me the favour of returning to this blog post later this evening to check out the details of the special promo happening Thursday and Friday--and please share with your friends. Yeah, a writer's life is weird. We write books we think no one will ever read, then people read them, and we think they'll never go anywhere while the entire time praying they will. The six of us writers of Novel Matters are so glad you're along with us on this weird ride, sharing your stories of your weird ride. My first book isn't due to come out until the first of the year and I am already tired of the fame it is bringing me in my work place. Yes, I want to tell everyone about it, but some days I don't want to talk about it ever again. Yes, it is weird being a writer. And, no, I can't imagine ever being truly famous. That would be so yucky. "I'd totally go ZsaZsa Gabor on them." Cracking me up! A writer's life is weird--agreed! Wendy: Glad to make you smile. Of course you're a nice Canadian!! 99.99999% of us are. The rest just got the wrong order at Tim's and they'll be fine in a minute. I'm fairly certain when my book comes out (see, all positive here) that my kids, my husband and my BFF's will *help* me crank down the mememememe stuff. I'm looking forward to the promo!! Jennifer, I love it: "The rest just got the wrong order at Tim's and they'll be fine in a minute." What a great line. So true! So many contradictions in this writing thaing! Hm. No. That should read that I have to step over pieces of Mr. Potato Head on my way to the store. I used to want to be famous. Eh. Now it just seems like a big hassle. Bonnie, I'm excited for the "big reveal"! Bonnie: I'm tickled that Cook is doing this promotion for you. Once people read you, they'll want more and more. Good luck on the obscurity thing. The rest of you: You're hysterical! Thanks for the smiles. Family has a way of bringing you back to yourself. 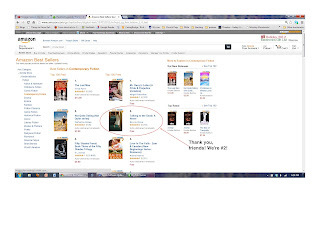 I recall my Mom asking if I would meet a friend of hers that was excited to meet me after reading my novel. My dad said, "She's excited. But she's easily impressed." Samantha: It's embarrassing, honestly. But all part of the package--and I've often found that when I stick my neck out I find not a guillotine waiting, but a kiss on the cheek. That's rewarding. Susie: It kinda goes back to that poem I posted yesterday. I have all the humility in place for succeeding--but I have all the humiliation of failure more so in place. I do remember Mr. PotatoHead. We kept ours--the kids don't play with it, but I couldn't part with it either. Success is having someone love my characters as much as I do, and thrill at the development in plot and personality with me. And the best way to be famous AND obscure is to put it in the will that the manuscript is the gold mine inheritance. This is very good marketing, Bonnie. I shall spread the word of you brilliance. Here's hoping this gets through!